I would like to think I More.com For this wonderful article.on the iPhone 4S. Nothing about 2011 was normal for Apple. Tim Cook had introduced the Verizon iPhone 4 at the beginning of the year and Apple had finally shipped the white iPhone 4 by spring. But unlike previous years, WWDC 2011 came and went with nary a mention nor a glimpse of a new iPhone. Steve Jobs went on medical leave again, and in August resigned as CEO. He passed away on October 5, 2011. Just the day before Apple's new CEO, Tim Cook, SVP of Marketing Phil Schiller, and other executives valiantly took the stage at a special media called "Let's Talk iPhone". There, under tremendous emotional strain, they introduced the most amazing iPhone yet. The iPhone 4S. The iPhone 4S, codename N94 and model number iPhone4,1, for the second time, kept the same basic design on the market as the iPhone before it, concentrating instead on improving the internal components. It was the first indication Apple was following a "tick tock" product cycle with the iPhone. For the iPhone 4S, it meant the same 960x480 326ppi Retina display and IPS LED panel. It also had the same composition, with two layers of chemically hardened glass sandwiched on either side of a stainless steel antenna band. The new Qualcomm RTR8605 chipset was dual-mode, however, so even the Verizon (and later Sprint) CDMA models could work on GSM internationally, making the iPhone 4S Apple's first "world phone". Wi-Fi stayed the same at 802.11 b/g/n on 2.4Mhz, but aGPS was augmented by Russian GLONASS (Global Navigation Satellite System), and Bluetooth jumped to 4.0 with support for both high-speed (HS) and low-engery (LE) modes. Typically radio-conservative Apple was making a big bet on the future of Bluetooth, and none at all on NFC (near-field communications). As was becoming the pattern with S-class upgrades, the processor got a significant boost - a version of the Apple A5 system-on-a-chip (SoC) that debuted with the iPad 2 earlier in the year. The A5 featured a dual-core Cortex A9 central processing unit with Imagination's dual-core PowerVR SGX 543MP2 graphics processing unit. Apple claimed a 2x general speed improvement and a 7x graphics improvement. Apple stuck with the same 512MB of RAM, however, but did introduce a new 64GB storage option. The battery got a slight improvement as well, up to 1430mAh, but it resulted in 8 hours of usable battery life for 3G talk, but a reduction in standby time. An infrared sensor was added to enable Siri's raise to speak feature, but otherwise the sensors remained the same. The front-facing camera retained the same, paltry VGA sensor. The rear-facing camera, however, got a lot of attention. It was increased to 8 megapixels and 1080p. The backlit sensor was improved, the aperture brought to f2.4, and made wide angle to capture more of a scene. They also added a 5th piece of glass to the assembly to increase sharpness, and an infrared filter to improve colors. The bigger news was the ISP (image signal processor) in the Apple A5 processor. It took the images captured by the camera and provided facial recognition for more specific automatic focus, and post-processing for much better white-balanced, stabilized, photos and video. It did, however, seem to find macro focus more of a challenge. Pricing again stayed the same, starting at $199 and $299, with the new, larger capacity model sliding in right on top at $399. 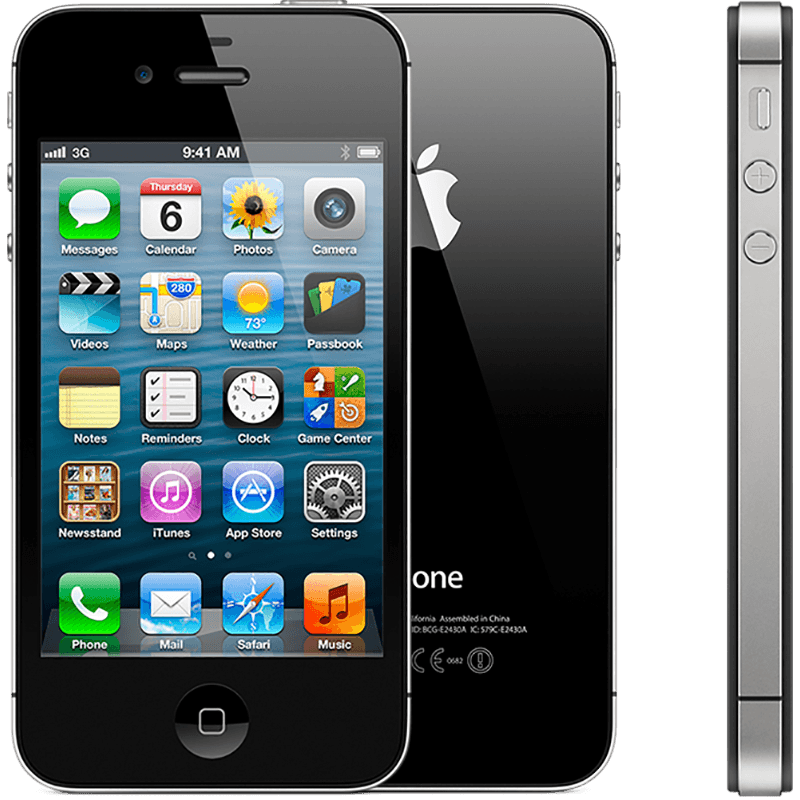 The iPhone 4S launched on October 14, 2011 in the U.S., Australia, Canada, the U.K, France, Germany, and Japan. It reached 70 countries and 100 carriers by the end of 2011. It sold 4 million units the first weekend. Steve Jobs was gone, but his greatest product, Apple, remained. The iPhone 4S entered a market facing greater, more relentless, and savvier competition than ever before. Still, it established the iPhone as Apple's new holiday product, and it once again sold more than any iPhone before. It was a painful, combative, heartbreaking year for Apple, but they endured.